The quaint town of Dinan, situated along the banks of the River Rance remains an intriguing destination for those seeking the charm of medieval France. The picturesque old town looks all the more pretty surrounded by an abundance of parks and trees. It still retains its 600 year old ramparts and castle walls, a reminder of Dinan's historical significance. A walk through the town, along the cobbled streets, will reveal further delights; the sight of timber-fronted houses, craft shops and weavers workshops all make this town stand out. 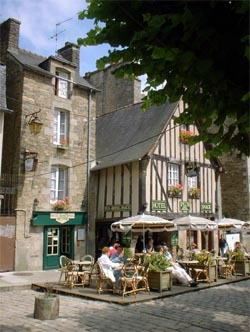 Dinan is relatively small and, with its old style charm, it attracts many tourists each year. Its few museums are made up for by the array of fascinating architecture that overlooks the town's streets. A highlight in the calendar is Dinan's Fête des Remparts. The town is transformed with decoration and many locals dress up in medieval garb for this two-day festival. Some 40,000 visitors come to Dinan at this time to take part in the spectacles - the fete is very popular and occurs only every other year - so do your research before planning a visit! As the town is located not far from the northern coastline, travel to and from the UK is very easy, explaining it's popularity among British buyers. Ferries travel frequently in and out of St Malo. Dinan, like much of Brittany, is perfect for family holiday-makers. Property in the region can be found between 60,000 and 100,000 euros, but you should expect to pay more the closer you get to the city, and property in Dinan itself tends to command a significant premium. Do you know Dinan better than we do? 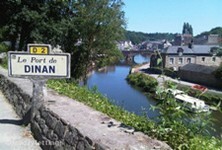 Do you have photos of Dinan? Dinan is in the very east of the department of Cotes d'Armor, slightly to the north. Access: The nearest airport is Rennes, although catching a ferry still seems to be the most convenient way of getting there. Economy: Tourism is the largest industry in the town. Interesting fact: The town celebrates its medieval past in a two day festival every other year called Fête des Remparts.